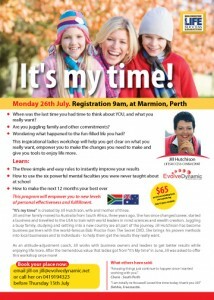 Jill Hutchison ran “It’s My Time”, a ladies workshop on West Coast Drive in Marmion, Perth, Australia. The feedback was tremendous from the 17 ladies that attended. Focusing on assisting women to get clear on what they want, understand how their mind works in order to change the results they get and realising that we are operating according to our conditioning. With thanks to sponsors Cedar Wealth and Trigg Island Beach Cafe. The prize winners were most grateful to Obsessions Hair Salon in Gwelup and Miglio Jewellery for some very special prizes. Q: What was most effective in the delivery of the seminar? “learning about the MIND and how to feed your sub-conscious. Jill Hutchison is available for group presentations and one-on-one executive coaching. 0419194323. 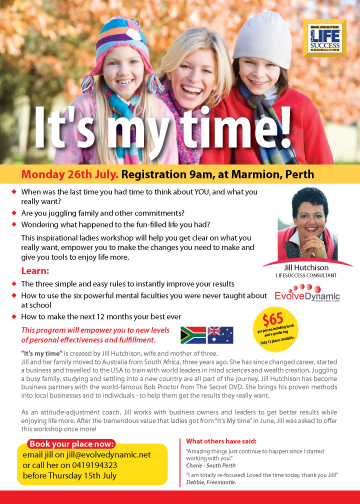 Jill is a business partner of Bob Proctor, from The Secret, and resides in Perth, Western Australia. Clients have called her a “Change Agent”; and Attitude Coach – or that “Mind-blowing coach!” She is well-known for asking questions that get to the heart of the solution for each person she works with. Thank you so much for encouraging my daughter. She has found it very helpful. The theme this week is The Law of Non-Resistance – which Bob Proctor and Mary Morrissey discuss as being in the flow. Where in our lives are we resisting what we could simply flow around? Mary talks about a river flowing – when it encounters a boulder in the way, it doesn’t waste it’s energy on how to move the boulder out the way, it simply flows around it. I have listened to his CD series “There is a Spiritual Solution to Every Problem” several times – and still keep getting new information from his talks! “Everything you are against weakens you. Everything you are for empowers you.” What we focus upon, we get more of. So if you are finding that you’re regularly saying ‘It’s all too hard’ then ask yourself what you’re resisting? When we focus on the problems in our lives – whether they be financial, health, business, employees, tenants, investments, property – we see more problems. We spend our energy resisting the challenges, instead of looking for ways to flow around them – to stay in the flow and get to our end goal in a different, easier way. I recently started a new business. I originally hired Jill Hutchison, from Evolve Dynamic, as a business coach to motivate and keep me focused on achieving my goals. Jill certainly has kept me motivated and inspired but has gone well beyond my expectations. Jill has expanded my thinking way beyond what I had ever imagined by challenging ideas, removing self imposed boundaries and opening up my mind to new possibilities and opportunities. She literally brings the creativity right out of you, turning ideas you thought impossible into reality. She has taken my business plans to a new level, six months ago I would not have imagined I’d be speaking with and working alongside some of the best mentors available in my industry. Nature uses a birth canal to bring about new life. So if you’re feeling squeezed right now, it is because something is seeking to be born in you today. True growth causes us to expand our life. Growth is rarely ever easy, but is always fruitful and worth the work. What great gift is seeking to emerge in you today? Can you name it? Some think that we must deal with two polarizing forces at once. They think that to attract good we must do away with bad, but this is not true. For example: if we’re cold, we do not work with the cold and the heat alike in order to get warm. We build a fire. We work with the heat. As we gather around that fire, we enjoy the heat that is extended from it and we become warm. We build warmth and the cold naturally disappears. As we focus on and resonate with the ideas which we are seeking to express, there is actually a generative frequency that goes into the universe. This frequency attracts unto it that which it is like. We build our attraction frequency in the same way we’d build a fire. Have fun today building your attraction frequency. “If a steamship lost its rudder in mid-ocean and began circling around, it would soon exhaust its fuel supply without reaching shore, despite the fact that it would use up enough energy to carry it to shore and back several times. The man who labors without a definite purpose that is backed up by a definite plan for its attainment resembles the ship that has lost its rudder. If you’re not clear on where you really want to go, you may end up being very busy but not getting anywhere! You may also get frustrated, exhausted and burnt out. Working with a professional coach to uncover your real goals – the ones that will inspire you to do what needs doing – is a great way to have achievement. Jill Hutchison is available to speak to you and your team – to improve productivity, increase motivation – and better staff retention with less stress. Jill is not just a coach, but a driving force to success! “It’s over, the mine’s closing – we’ve got to move.” These were the words I heard on January 21st 2009 at 7:49am when my husband called me from work. Three months later, over 1000 people who worked at the nickel mine were out of a job, including my husband. This is the time when I truly realised how important it was to deal with emotions and to decide which feelings and emotions will serve us best to get us where we want to be. I also realised how crucial it was to have a coach or mentor to hold me accountable to my goals, particularly at a challenging time like that; Someone who could focus my attention on the opportunities that this unique situation was presenting to me. Are certain emotions bad? Are there some that we shouldn’t feel? What about the positive thinking fans – are they saying we should be happy all the time? All emotions have a purpose. In my opinion all emotions are good and healthy! No-one can tell you which emotions are the ones that are best for you at any point. You are the only one who can control your emotions by selecting which thoughts to plant in your conscious mind. I use the word “control” lightly – I believe in controlling emotions through selective thoughts that create the feelings. If there is strong emotion due to a great event, it’s important to acknowledge it rather than try and push it down. What happens when you put a lid tightly onto a pot boiling on a stove? It tends to stay on there till the pressure is too strong, at which point it will burst right off. Feel the feelings and verbalise them if you can – channel them in a productive way. Sometimes anger and/or frustration are what you need to get you out of your comfort zone and into action. Complacency keeps us where we are and doesn’t move us anywhere. The key with emotions and feelings is to recognise that you have the ability to select which emotions you choose to feel for most of the time. Obviously if something happens – a disaster, losing a loved one, the instant reaction is to feel sad, scared or various degrees of upset. Thoughts cause feelings. You can choose the thoughts that occupy your conscious mind on a daily basis (you can’t always prevent outside intervention from delivering an event that elicits a powerful emotion). Think of a blackboard – was there a time in your school life that you had blackboards in your classroom? (I’m ageing myself here!) – do you remember when someone scraped their nails down the board and sent shivers down your spine? You can probably feel those shivers right now, even though you are no where near a blackboard! All I have done is planted a thought in your mind, and you instantly feel the feeling. This is how powerful your mind is! You have the power to choose whether to have the TV on or off. You can listen to any radio station or youtube channel you choose. If one of your loved ones is watching something that gives you a feeling you’d rather not have right now, then you can walk away – you don’t have to sit and watch it! Where do you really want to end up? What do you choose to do or to be for the rest of your life? If you want to be more successful in business, and are facing some economic challenges, then you might want to screen the information coming into your mind. Bad news sells media more successfully than good news does, that’s simply a fact of life. Which emotions or feelings are going to serve you going forward? I would like to suggest that positive uplifting feelings (gratitude, happiness, laughter, optimism) would be more productive than the feelings that create a lower vibration, such as sadness, fear, anger. Following that phonecall, I experienced first-hand the effects of selectively choosing my emotions. We could dwell in the thoughts of how unfair the situation was (we loved living in this beautiful little coastal village – and had only settled there 18 months before) or we could focus on what outcome we wished to experience. I chose to focus on the outcome, even though there were days where I would rather have yelled and screamed and got more frustrated! As a new business owner, I recognised that one of the solutions was to increase business coming to me. The funny thing was that on days where I was focused on this aim, I was amazed at how many successful phonecalls I made, how I was invited to speak to businesses and groups far and wide. On days where I chose to go into town and chat to everyone, hearing all the stories of challenges various families were facing, even though I still felt optimistic – those were the days where I made little progress in my business. You see, when our vibration is low, we don’t feel like taking the action to do the things that get us results. Put a thought into your mind, it creates the feeling, the feeling affects the action we take – and it’s the actions that get results. When everything is hunky-dory, you can absorb a lot more than you can when you’re facing a challenge. Bad news is like water off a duck’s back when everything is going as you wish it to. But when you are faced with a challenge that you want to overcome or turn into a benefit, then you need to selectively only entertain thoughts that serve you to get where you want to go. I would like to challenge you to think of which feelings and emotions are serving you right now? Are you feeling like a victim? That the company you worked for gave you a really raw deal? Perhaps they did – but your feeling like a victim and allowing it to eat into your soul is not doing anything to them – it’s only destroying you. Do you feel like no-one appreciates what you do? Perhaps you’re not appreciating what you do! Bitterness twists your soul – and sours all the relationships you have. If you would like to feel greater happiness, better business success and a more rewarding life, then you will probably decide to focus on the things around you that are going right. What are you grateful for? What thoughts do you need to think to get you there? When your mind is occupied by positive thoughts, you are much better equipped to deal with the challenges life throws out. If you’re dwelling on the injustices, another challenge is going to feel like you’re drowning at sea and being hit by yet another wave. What is the problem not? Less than a month after the news of job losses and mine closures were announced, everything was put into perspective for us. Bush fires in Victoria, Australia, claimed thousands of lives and homes – and went on for days. My heart went out to the families that lost loved ones, lost their homes and pets in the fire. The little issues we were facing were so tiny in comparison. Look at whatever challenge you might be facing right now and identify what the problem really is, and what it’s not. Is it a matter of life and death? Is it a matter of health? Is it about money? Is it about relationships? Is it about business? What positive memories or events could come out of this that could make a wonderful difference in your life? Sometimes it takes losing someone near and dear to us to shock us into valuing those left behind. “When we change the way you look at things, the things around you begin to change” Wayne Dyer. If you live in Perth or Sydney, Dr Wayne Dyer is coming to Australia in August 2010. Well worth going to listen to him and the other great speakers. Jill Hutchison, Attitude Adjustment Coach, LifeSuccess Consultant.